A 3D construction model starts by first “fabricating” the pieces for the construction and then assembling them exactly as they would be put together in the real world. You can make the pieces as you build the model, or copy and paste them from any previous models. Inferences and guidelines simplify the assembly and the final quality of the construction. The key to fast construction modeling is to keep the pieces named and organized so that they are readily available for both field changes and new constructions. The best way to keep a large collection of proprietary pieces organized is in a library folder on your hard-drive. Alternatively, for some projects, you might want to set up a virtual staging area in the same or a separate SketchUp model file. Lay-down yards or staging areas help visually control materials and manage inventory. 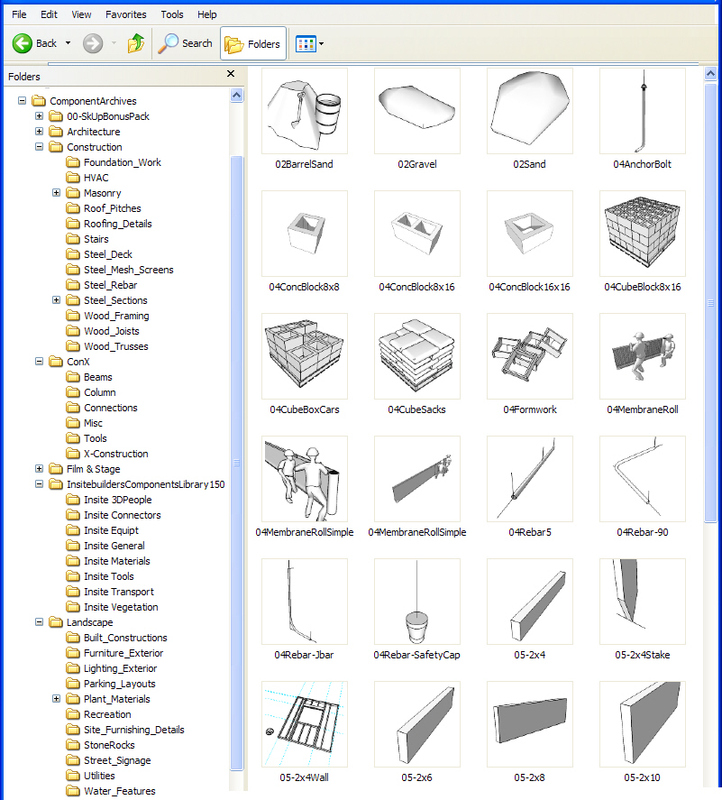 Pieces you drag into a model from a library folder are always Components, while pieces you copy from a virtual staging area can be either Groups or Components. The difference is important because Groups can be edited without affecting copies of the group in the same model. But Components must be made “unique” so they can be edited without affecting their clones or matching copies. For a construction model, minor changes to a series of Components can quickly overwhelm even a simple piece-based assembly. It’s much faster to Explode, Group, Edit and rename the Component as a new Group, especially if you use the Outliner to track a materials list. 1. First, there are the Inferences found on the body of the piece itself. These include edges, faces, midpoints, and corners. Each is a snap point for one of SketchUp’s tools. Hover over the piece with the Move or Rotate tool to see inference hints. Then click to snap the tool to that position and start the command sequence. 2. Motion Inferences are red, green, or blue dashed lines that become visible as you Move or Rotate a piece parallel to a SketchUp axis. The Shift key constrains the motion. Press the left, right, or up arrow key to lock movement to an axis. The Control key is used to leave a copy. 3. Reference Inferences are similar to motion Inferences. They display a dotted line when two Inference points are aligned. Touch the reference Inference point with the cursor while moving or rotating a piece into position to let SketchUp know the desired alignment. Here’s where the Shift or arrow keys are often necessary to constrain the move. To assemble cylinders (pipes, tubes, and fittings) use mating extensions. The extension can be a projection from the centerline of the piece or any other axis important to the assembly. A fixed length extension makes it possible to quickly join their endpoints and then move the pieces together. Guidelines are necessary to ensure the quality of the final construction in the same way stringlines and chalklines are required in the field by any good builder. 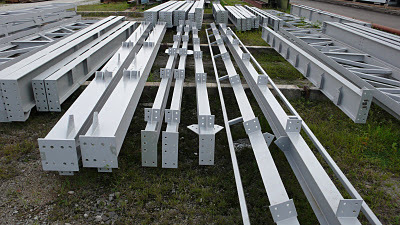 They act as temporary references for site layout, as well as intersecting snap points to locate plates, studs, and rafters. Guidelines are also important to center window and door frames, position equipment and furnishings, and install parts of a building’s system. When pieces are assembled and tracked in virtual construction in the same way as they would be on a jobsite, the sequence and scope of the work is automatically built into the construction model. And when these same pieces are nested into sub-assemblies, phases, and sub contracts in the Outliner, their visibility can also be controlled. This makes it possible to both illustrate and animate the scope of the work, adding new potential to your practice and your market presence as a builder and construction manager.